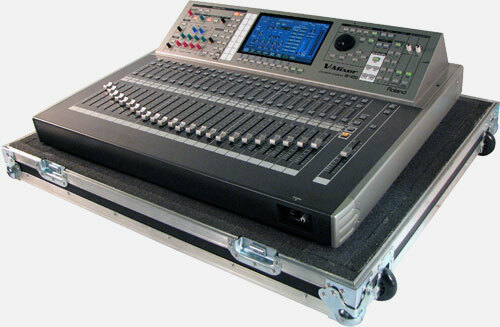 This road case is custom made for the M-480 and M-400 V-Mixer Consoles. Wilson Case uses only top quality raw materials and hardware to manufacture tough shipping cases that are able to be used again and again. Strict quality control guidelines are followed through out the production and inspection phases. Wilson LT Reinforced Tri-laminate - 100% recyclable Polyproplene with non-directional cellular center, 7mm, talc-filled. Thermoformed center layer is laminated to outer layer hermetically sealing air loaded cells. When third layer is laminated to the opposite side the resulting three dimensional sheet is stronger and lighter weight than laminated plywood or extruded polyethylene sheets. Extruded aluminum; 6063 alloy; heat-treated to T-6; 1.1875" ; machine-riveted to case walls every three inches. Exceptionally deep tongue-and-groove closure; extruded aluminum 6063 alloy grade; heat treated to T-5; with oblong channel in goove to secure optional neoprene gasket; both tongue and groove have full inner leg for superior strength. Stainless steel; continuous piano hinge; riveted through both inner and outer leg of double-walled valance every two inches. 14-Gauge plated steel, stackable (top corners have depression to accept rounded bottom corner for secure nesting when stacked). Recessed; plated steel; positive action butterfly twist style. Does not require valance to be broken. The latch spans tongue-and-groove to eliminate dust and moisture and preserve the integrity of the case. Recessed; plated steel; spring loaded 3/4" diameter rubber grip sleeves. Deeper dish in handle located on lid (when applicable prevents handle from interfering with stacking ability. Machine-driven; plated steel; spaced a maximum of 3" apart.